As I continue to wrap up my dissertation on the historical Jesus' understanding of the role of the cult in the eschatological age, I am continually struck by the fact that many incredibly relevant passages in the Dead Sea Scrolls and Pseudepigrapha are rarely mentioned by scholars. One frequently sees certain passages cited over and over again (e.g., 4Q174), but other striking texts are often ignored. Why is this? I'm coming to a rather troubling conclusion: scholars seem to be reading each other, but not the primary sources. 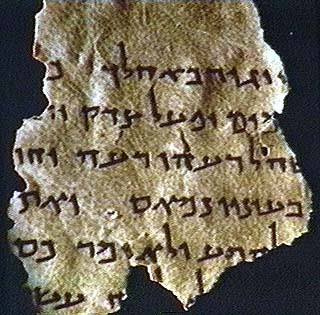 I think anyone publishing works on New Testament studies should have at least read through all of the published Dead Sea Scrolls, and the the pseudepigraphal writings--especially 1 Enoch! It seems to me though certain fragraments from Qumran get usually get attention from scholars and certain chapters in pseudepigraphical works are mentioned, a lot of relavent data gets overlooked. In other words, it is suspicious that different scholars treat the same texts while ignoring others. When I read Markus Bockmuehl's work Seeing the Word: Refocusing New Testament Study (Grand Rapids: Baker Academic, 2006), I was glad to see someone else voice these concerns. Yes, you're right. Another problem lies in not reading the primary sources in their original language. Too many scholars I think use the Greek to refresh their memory of the English translation rather than reading the text on its own. Just another reason to roll my eyes the next time I come across the words "scholarly consensus." Very good point, Michael. Too often reading the work of others substitutes for an independent evaluation of the ancient evidence itself. A worse crime in scholarship is hard to be found!